I really wasn’t looking for a picture book. My son’s eleven, and learning to be cool at secondary school; my daughter’s nine and newly obsessed with the works of Lauren St John. Sad as it is, I think the time for buying them picture-books is over. And yet… sometimes you just fall in love with a book. Sometimes you have to buy it, even though there’s no-one in particular to buy it for. 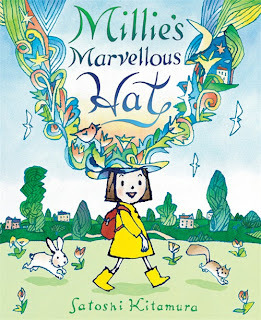 This is how it was with Millie’s Marvellous Hat, which I bought at a festival at which Satoshi Kitamura and I were both appearing. Really, the only way to tell you exactly how wonderful this book is is to reproduce it - pictures and all, for (as you’d expect from Satoshi Kitamura) the illustrations are every bit as gorgeous, every bit as colourful, and every bit as mind-expanding as the text, and of course they complement each other perfectly. Just go, find it, and read it - as soon as you’ve finished this article, of course. You see, I want to tell you what happened when I brought it home. I’d asked Satoshi to sign it without dedicating it to anyone - I thought that, just for me, I’d read it to my own two just once, and then put it in the presents trunk and give it to some small child on their birthday. My children are terribly indulgent. They let me read it to them, and even the big, learning-to-be-cool one offered his opinion and agreed that it was a good book. Then I caught my nine-year-old reading it for herself. And then I caught her reading it again. Eventually, I had to admit defeat and give it a home on the bookshelf in her room. But yesterday I borrowed it and took it down to the kitchen, so that I could re-read it prior to writing this review - and guess what? I caught her reading it again. “Why do you like it so much?” I asked her. Well, she told me, it’s that… it’s about the imagination. She reads about Millie imagining, and then, when she’s finished reading, she can imagine her own hat. So there you have it. 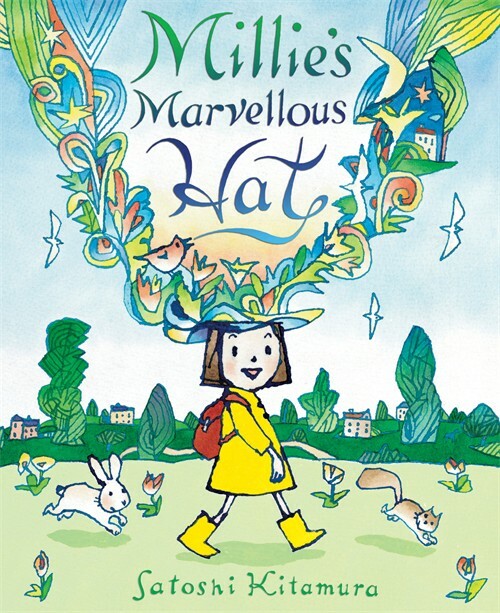 Millie’s Marvellous Hat by Satoshi Kitamura: a truly marvellous book, both hymn to and stimulus for the imagination, and your Awfully Big Recommendation for today. Sounds absolutely wonderful - far more than "just a picture book" and a good story about the magic of sharing books. Lovely review, John. The very best picture books have a way of inveigling themselves into one's psyche, don't they? I love books that creep up on you like this. This book will now have a place in your family story - what greater accolade can there be for any writer?